The Texan metal and alternative music history revering, J.D. Cronise fronted quartet of The Sword. Earnestly open up their explorative, grinding and rustic rooted Black Sabbath and Alice In Chains styled, instrumentally drawn out and atmosphere imparting set. A piercing artillery of percussion and bass pellets drills into the minds of attentive attendees who remain largely still, letting the bending epics unfold. 'Black River' features churning guitars that wrap around the rattling percussion to bring a droplet of Led Zeppelin to the forum. The term molten has been used as an adjective for these guys more times than in historical accounts of Vesuvius, but that is an unrealistic and summarization of these explorative and authentic alternative musos. With the start of the main band's appearance delayed considerably, it is a wise move for the rugged troupe to commence with a cutting, heart-fired rendition of arguably the best song in their impressive catalogue, 'The Soapmakers'. This is taken from the searching and instrumentally potent, 'The Elephant Riders' album of 1998. 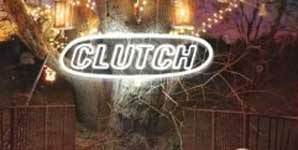 It is the epitome of Clutch's jam-metal/rock sound, featuring a country current that has earned them respect throughout their long career. Bearded vocalist and guitarist, Neil Fallon if anything, has added an earthier, steely grit to his vocals that tell tales of hard-life and hard-times better than Dickens and Dostoevsky. Tonight, the Academy Three becomes a shell, as earnest alternative music that spans seventeen years protects the packed crowd from all the trends of modern times and even past ones, as this Maryland quartet remain steadfast in their instrumental range and rugged tale espousing. The loftier pitch found in 'Burning Beard' is exemplified by the tight, hollow acoustics of this close knit venue and an old fashioned pit is formed with ease. Fallon is friendly, but focused, both during songs and between them. He tries to deal with numerous cries for obscure songs from their back-catalogue that they probably haven't played in a decade. An orchestral rock new song shows that a penchant for experimentation as well as volume and intensity over melody, still lurks luridly behind them and whatever they do. An Elvis pitch seeps through the haunting and frantic 'Electric Worry', before merging into Lynyrd Skynyrd territory, keeping the profile of proceedings rising. The late start means that the sacred 11pm curfew is breached by a few minutes. You get the feeling that Clutch still has another gear available to them. However, they have still emphatically displayed a love and enthusiasm for the live environment that will surely continue for many more years to come.